Lots of writing on this Monday morning, so much so, I had to get a head start on it on Sunday night. It's New Year's Eve and we have some afternoon games going today, so once the Newsletter was published, I was going right to the social media lines to check and see where the starters were, since Week Fourteen gets started at 10:30am MT with the Nashville and Washington game. On the plus side, a few of the teams were already naming starters on Sunday, so we were ahead of the game in a number of spots. The new week begins, the goalie survivor game is now over, so now we'll concentrate on the overall standings and the weekly honours. Overall will be the name of the game today, since the week is only just getting started, so here we go! Really early start in Washington this morning and there were no confirmed goalies at the time the post went live, so we're leaning towards the number ones getting the start in a European showcase game today. The only argument I could see that would change their minds is the curse of the afternoon games, which some goalies are ill-prepared for and come away injured. For both team's sake, this might not be a bad game to dress the number twos. It's a moot game in the crease in New Jersey this afternoon, when the Canucks take on the Devils. There are a couple of hockey pool goalies sitting out of this one, one likely to save him from the afternoon grind, while the other one is giving way to a hot hand. I'll let you decide which one is which. It's an afternoon start in Minnesota for the Penguins and the Wild, but certainly not as early as the other two games that we led off with. Still, neither goalie has been confirmed, so we're also taking to the number ones in this one, as a solid potential match-up. The Penguins are back in a playoff spot, while the Wild are scratching and clawing for one, so this makes some sense today. The Sabres confirmed that Carter Hutton would indeed be the guy tonight with the Islanders in town, which is good news for Wes' team. Chelsea also gets some good news, as Robin Lehner was the first goalie off the ice at practice this morning and the coaching staff confirmed that he starts against his former team. Chelsea gets her only start of the day in this game, 80 points out of the money, while Wes potentially has his second game of the day, 28 points out of the money. Two very contrasting pool teams here. The Philadelphia Flyers are having a hard time saying no to Carter Hart, as they will be giving him another start on the road tonight in Carolina, taking on the Hurricanes. He is certainly making the goaltending situation more and more interesting, as we draw closer to some goalies getting healthy again. The Hurricanes goaltending hasn't been a problem of late, it's been their scoring, but that still suggests to me that Petr Mrazek should get the call today, but that's unconfirmed and among the picks that could change just as easily. The Rangers were certainly nice enough to confirm early that Henrik Lundqvist would get the nod in St. Louis tonight, when they take on the Blues. The Rangers haven't been good on the road this season, 5-10-2, so it could be tough for Scott to get the 2 points tonight, but anything is possible, I guess. The Blues haven't firmed up any goalie decisions, at the time of the post, but there's no reason why they won't go back to the well with Jake Allen tonight. He's their guy, through thick and thin. Kristy & Don will get yet another start out of Sergei Bobrovsky and the Columbus Blue Jackets, when they play host to the Ottawa Senators tonight. The duo are having troubles cracking the top three lately, opening up play today 5 points back of 3rd, so they'll lean heavily on Bob to get the job done and help them into the money fray. The Senators confirmed that Marcus Hogberg will make his second career start tonight, with Craig Anderson still injured. No confirmations here yet this morning, but it's an evening game and both teams are trying to fight their way back into the Eastern Conference playoff race. The Panthers open tonight with a 2-point lead over the Red Wings in the standings, so you better believe that these two will be starting their number ones... until they don't and make me look silly. The Lightning and Ducks haven't confirmed their goalies either yet and there's no reason why we wouldn't see the big guys out there in their respective creases today. The Lightning are running white hot at the moment, while the Ducks still own a playoff spot, but they are sub-.500 in their last 10 games and could really use a statement game to help turn things around. A win against Tampa could be that statement. The Avalanche confirmed that Semyon Varlamov would get the last home start of 2018 on Sunday, so Wilton was assured one more start in the calendar year and it's a promising game for points, as they host the Kings tonight. Wilton's team sits 44 points out of the money at the start of play tonight, so those points would be very useful. Although it's unconfirmed, it seems very likely that Jonathan Quick will go yet again for the Kings. Who else do they have? There has been no word on Carey Price rejoining the Canadiens on their current road trip, so it would seem that Antti Niemi would get the start again tonight in Dallas for the club. The Stars are starting to pick things up again after their upper-management kuffaw, so we're leaning towards the number one in Ben Bishop here too. No guarantees, but this seems likely. Much of the same in Calgary, with the Sharks in town to take on the Flames. After a night off for both sides yesterday, I think we'll see the guys that both teams have been leaning on for results this season. David Rittich was actually confirmed last night, so that means we know that Ryan will get one start at least. His team starts 22 points out of the money and still making positive moves in the standings. Finally, it's going to be a wicked retro night in Edmonton tonight, since both the Winnipeg Jets and Edmonton Oilers will be rocking some retro colours tonight. The Jets will be wearing an iteration of their WHA/NHL jerseys, in Adidas fashion, while the Oilers will have their alternate jerseys on tonight, which have a shoutout to some of their older retro duds. As for the goalies, nothing confirmed yet, but why not Hellebuyck versus Koskinen? We're ringing in the New Year tonight and that means that the NHL is going outside tomorrow. It's a couple of the usual teams playing in the Winter Classic, as the Blackhawks and Bruins will be meeting at Notre Dame Stadium in South Bend, IN, home of the Fighting Irish. These two teams have been pretty well a constant in these outdoor match-ups, either one of them playing in a good portion of the outdoor games in the NHL's last 10 years of outdoor games. The jerseys that each team are going to be wearing are looking fairly sharp, excellent throwbacks to the early days of these two sides, we'll be in for a visual treat. More importantly, the question is, will be treated to a lot of points in the hockey pool? Between the two NHL clubs, our 25-team hockey pool has 23 players selected, but not all of them are going to get to play. On the Chicago side, Corey Crawford is out indefinitely with a concussion and defenseman Henri Jokiharju is away in Vancouver/Victoria playing in the World Juniors for Finland, so neither are playing in tomorrow's game. For Boston, Brad Marchand is expected to play, coming off of an upper-body injury, so minus any setbacks, he should be there. Charlie McAvoy's status will be dependent on whether or not he practices on Monday on the outdoor ice, he has been on the IR for the last couple of days, but is eligible to come off when he's ready to go. He's day-to-day and questionable for tomorrow's game. What does that leave us? Well, Stacey M. leads all teams in the pool with three skaters and a goalie, while Stuart and Tony will each have three skaters on the ice for this game. We don't know who the starting goalies are going to be just yet, so there's still some intrigue left here in the pool. No money in the outdoor games again this year, which was too bad for Tony's team last season, as he walked away with the title with 8 points in the three games outdoors last season. He's certainly got another good shot at it again with three players in this game and the Stadium Series later on in February, still to be played. It's an 11am MT start tomorrow, so you should have more than enough time to sleep in and nurse those hangovers before the game starts. Despite the shortened schedule, the hockey pool had some pretty good performances in the week, as five players were tied at the end of the week with 6 points, so we had to go to the tie-breakers, which as you can see Patrick Kane of the Blackhawks won. First, we eliminated Robin Lehner of the Islanders, he's a goalie and didn't have any goals, then we took out both Nikita Kucherov of the Lightning and Phil Kessel of the Penguins, as they only scored two goals. Then it got tough. I had to dig deep to break this one and separating Kane and Mathew Barzal of the Islanders was a matter of game-winning goals, 2-1, being the difference, since both players scored 5 goals, had a +3 rating between the two games. Kane did his damage against the Minnesota Wild on Thursday, scoring his hat-trick there, and then on Saturday against the Colorado Avalanche, 2 goals and an assist. Definitely a solid couple of outings for the Chicago sniper. This brings his season total up to 22 goals and 50 points in 40 games this season, good enough for 8th overall in hockey pool scoring. Stuart took him with the 14th overall pick this year, so he's definitely getting the value for his pick selection. Grant's week finished early, not having any participation in the only game on Sunday between the Golden Knights and Coyotes, but he had more than enough points to worry about just one game, as he comfortably took the Mover & Shaker for the shortened week with 29 points. His team was obviously visited by Santa Claus and given all the best stuff, like sick mitts and filthy moves, and they were all eager to show them off to their opponents. Having two of the five players that were involved in this week's Player of the Week tie-breaker was certainly a huge help to his team. 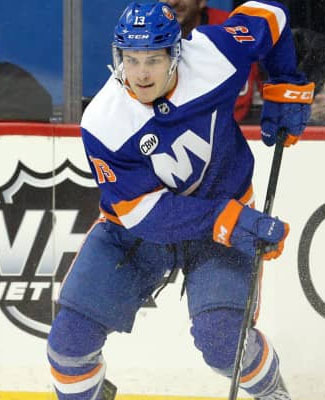 Mathew Barzal of the Islanders and Nikita Kucherov of the Lightning made some waves with 6 points each to lead the way. Anton Khudobin of the Stars got a shutout in his only start, collecting 4 points, while Brock Boeser of the Canucks and Tyler Johnson of the Lightning each had 3 points to help out. In total, Grant's team scored 14 goals in the week, which was 5 goals better than his nearest competitor. He can thank the 24 skater games he had for all those chances at points this week and even three appearances from his goalies were good enough for 6 points at the end of the week. This is Grant's fourth Mover & Shaker of the week nod this season and his team has been on a bit of a mission since a bit of a slow start in the first couple of weeks. This is now his third week in a row, where he has finished in the Newsletter in the money spots, now in 2nd place, tied for 1st with Stuart, but losing the tie-breaker in goals. Can Grant's team be stopped? A Reilly Smith goal for Stacey M.'s team in the Vegas/Arizona game last night tossed the Basement Dweller race into a tie-breakers with Derek B., as both teams finished Week Thirteen with 9 points, but was that goal enough to lift her team up and out of the Basement Dweller nod, adding to her tie-breaking total? The answer is... yes. Yes, it was. The Smith goal gave Stacey's team a total of 3 goals in the week, while Derek's only had 2 goals, so by that 3-2 margin, Derek's loss gives him the Basement Dweller for Week Thirteen. Eric Staal of the Wild, Colin White of the Senators and Jonathan Quick of the Kings all finished with 2 points each for Derek's team in the week, which would have been enough for the Player of the Week, if they were all combined and to think our Mover & Shaker had two of the 6-point players this week. Eight of Derek's 14 players failed to register points in the week, one due to injury and another is at the World Juniors, so overall, it was a very pedestrian effort here. This mention in the Newsletter shouldn't be too discouraging for Derek's team, since he opted to leave the overall race and just focus on the rookie points, which hasn't quite worked in his favour just yet and it hasn't helped his side in the overall standings, staying static in 23rd place since the end of Week Ten and ranks last in points in this second segment of the season with 71 points in the last four weeks. It's back-to-back weeks for a tie at the top of the standings, but the only difference is, the team that is tied with Stuart's, losing out to his in the tie-breakers. Stuart and our Mover & Shaker, Grant, sit atop the standings at 368 points, while Stacey M. had a horrible week, in the tie-breaker for the Basement Dweller, which dropped her team to 3rd at 357 points to round out the money spots. Kristy & Don are 5 points back at 352, Troy's team fell off a bit, now down by 9 points, while Mike's team is still a couple arms lengths away at 17 points back of 3rd. Week Fourteen ramps back up again and we'll have 53 games on the schedule, so a good Mover & Shaker week can really do wonders for the money race, maybe even bring another team into the mix. There were a few points to be had among our league's freshmen, but the best contributions to the hockey pool teams was only 3 points and our two leading teams in the rookie pool collected those. Both Clayton and Derek B. saw 3 points in Week Thirteen, extending their lead over everyone else competing for their money back here. Clayton's team still holds a 20-point lead over Derek's team, 56-36, while John P.'s team, held pointless in the week, is back at 28 points. Only six games went to extra time in the four days of action in Week Thirteen and none of those six games went to the shootout. No dirty dangles. No silky smooth mitts. No big stops by the tendies. So, the totals remained the same. Jeremy, Grant, Mike and John P. all have 6 shootout markers and Brian's team has 5 of his own, all to lead the way in the mini-game here. It was a bleak week to say the least, but again, a busy week coming up, so we're bound to see some skills competitions before too long. Out of 32 games this past week, we collected 20 game-winners from the bunch, which has been close to the season average all year, so far. Five teams each picked up a couple of winners to lead the way in the week, including our mini-game leader, Stuart, who now has 28 this season. His team is 6 better than both Benson and Clayton's teams and 7 better than Mike and Tony's teams. There have been a total of 561 game-winners scored in the NHL through 14 weeks and the pool has collected 395 of them for our own personal gains. That is actually coming in at a rate of 70.4% of the goals actually scored, which is damn good. 19 minutes was tops in the week for the goon teams of the week. Yes, that's right... teams. Stuart, Grant and John P., all three are mini-game favourites in this edition of the Newsletter, all finished atop of the goon standings for Week Fourteen. Stuart's team is still the goon team to beat though, still racking up the PIMs with 276 in total, followed by John P. at 231 and Scott's team at 229. It's not even a close race and Stuart's team is also leading in points. Where does his team find the time to score? The holiday shortened week was what the goalie survival game needed to finish up, as both Stacey M. and Jeremy were unable to see their goalies pick up wins in Week Thirteen, leaving Troy as the last team standing and taking the nod this season. Marc-Andre Fleury of the Vegas Golden Knights has been nothing but consistent this season and playing a ton too. Fleury got the qualifying win on Thursday against the Avalanche and then got a second start on Sunday night, which ended up as another win against the Coyotes. Congrats Troy on the bragging rights for the rest of the season, it's too bad the mini-game wheel wasn't going to reward you for the win though. Scoring found a decent recovery after that embarrassing display we saw in Week Twelve, almost going back up by a whole point per NHL game this past week. The pool collected 396 points in 32 games, which comes in at an average of 12.4 points per game, still well back of our season-high of 14.55 in Week Eleven. Skater games held fairly steady, while goaltending numbers continue to dwindle and we're still four weeks away from even starting to think about drafting again, so the goaltending may still decline in those weeks. Let's hope that the skaters can keep plugging those backup goalies and keep racking up the points.